His name notwithstanding, Swift's rise in the culinary field has been methodical and covers 30 years. A Baltimore native, Jay started out in the restaurant business at the age 14 and financed his high school and college English education through restaurant work. After two and a half years of college, he decided to follow his passion and palate and he switched gears to head back to the kitchen. Jay enrolled in the American Culinary Federation Apprenticeship Program and graduated first in his class. During his apprenticeship, he worked under Certified Master Chef Rudy Speckamp. Upon graduation, Jay worked at the venerable Mayflower Hotel and in the kitchen of noted restaurateur Bob Kinkead's 21 Federal in the nation's capital. Boston was the next stop in his carefully crafted culinary career where he worked as Line Chef for Lydia Shire at Biba. Jay eventually returned to his native Maryland, where he worked at both the Polo Grill and Windows at Baltimore's Renaissance Harborplace Hotel. His next move was to New York City to become the opening chef for Foley's Fish House at Times Square. Jay then headed south and took the reins at South City Kitchen in Atlanta. 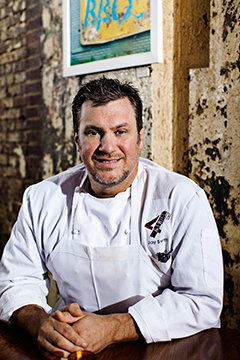 He won raves for his successful overhaul of the restaurant's contemporary Southern menu and South City Kitchen was designated one of the top twenty restaurants in Atlanta by the Zagat Guide during Jay's tenure. Jay is also active in the Atlanta community. He serves as the chef co-chair for The Flavors of Atlanta, a popular culinary event that benefits the Georgia Chapter of the American Liver Foundation. Jay also supports Share Our Strength's campaign to end childhood hunger with his participation in Taste of the Nation and Give Me Five event. And he has been honored with two invitations to cook at the renowned James Beard House in New York City. Chef Jay Swift highlights seasonal and daily-changing market menus to utilize the freshest ingredients at all times. Located in a former engine room of the Southern Dairies, 4th & Swift serves modern American comfort food in a space indicative of the buildings rich past in Atlanta's eclectic Old Fourth Ward.